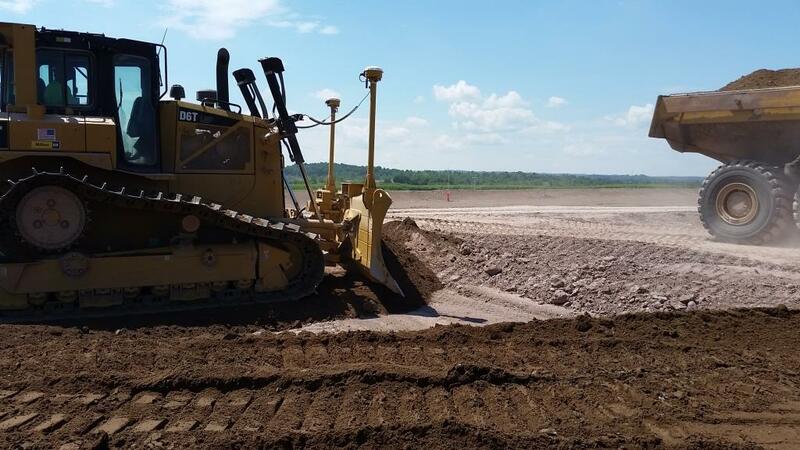 Home » Gallery "Covering the Consolidation Area"
August 2017 - Honeywell worked with local environmental and wildlife stakeholders to develop the vegetated cover for the consolidation area. 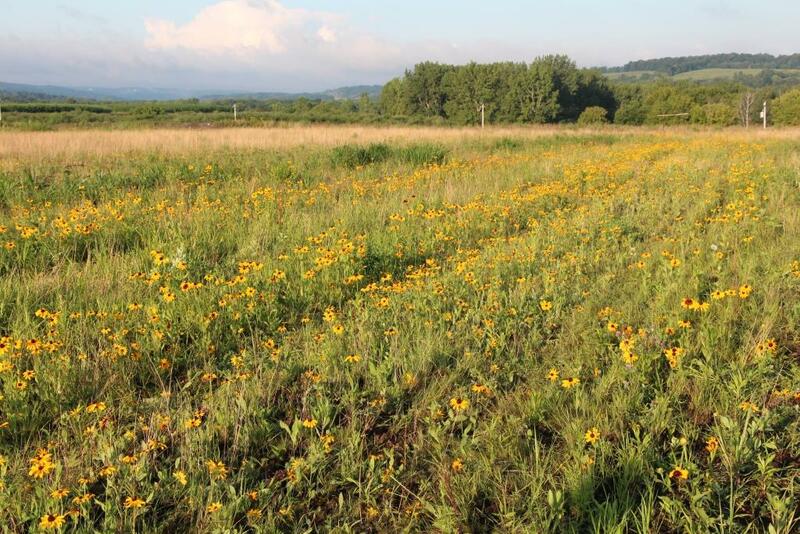 Restoring grassland habitat is important to grassland bird species, which are declining very quickly, according to Audubon New York. 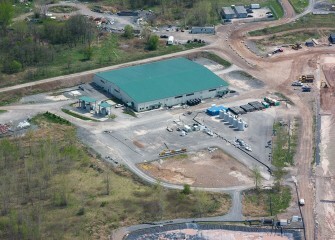 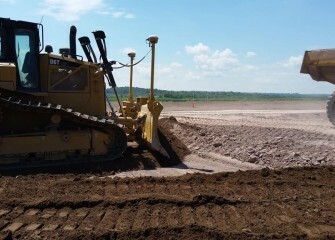 May 2017 - Equipment is mobilized to resume construction at the consolidation area. 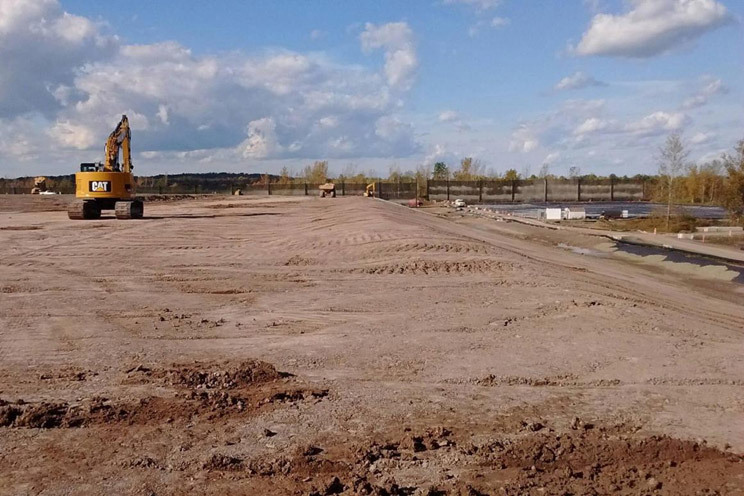 November 2016 - Approximately 50 acres at the consolidation area will improve conditions for birds and other wildlife in the Onondaga Lake watershed. 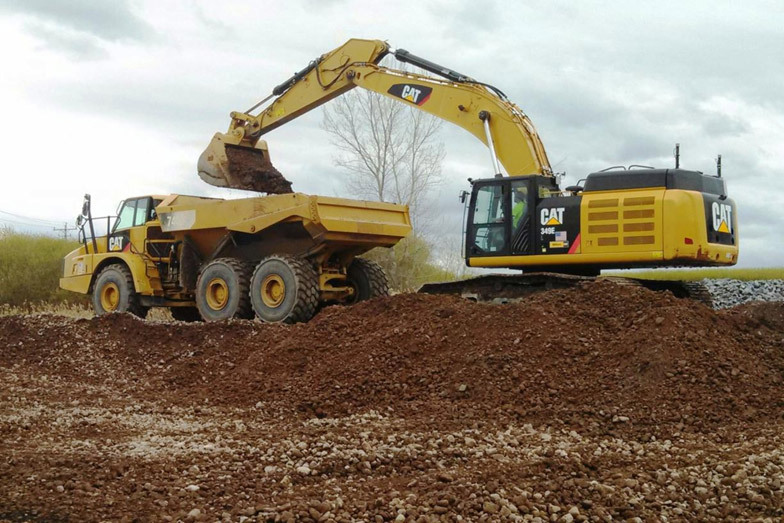 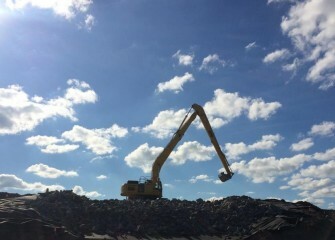 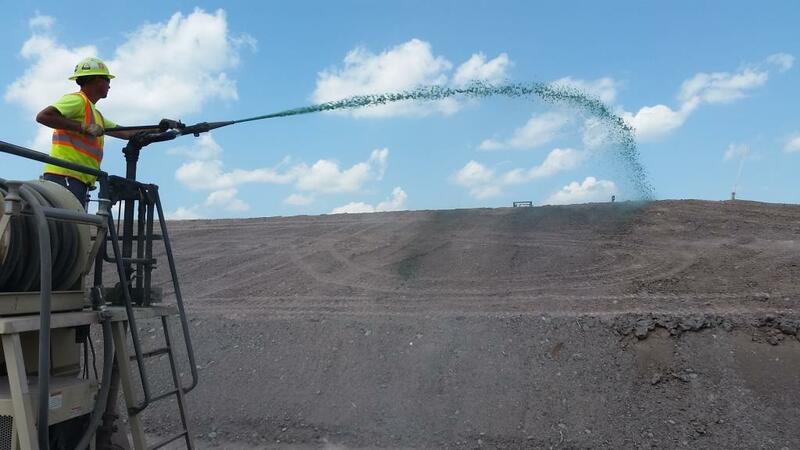 November 2016 - Honeywell is working in cooperation with local environmental and wildlife stakeholders to explore innovative ways to enhance the traditional vegetated landfill cover. 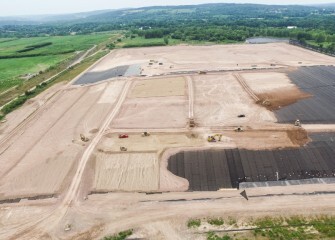 Planting will continue in 2017. 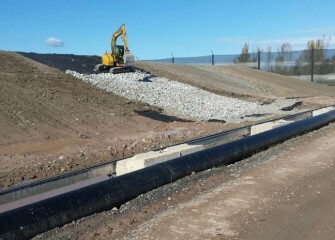 October 2016 - Rock is placed in a drainage channel. 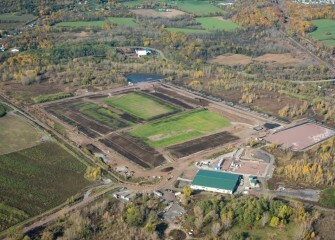 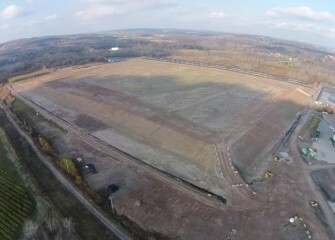 September 2016 - Grass begins to grow on top of the consolidation area. September 2016 - Sections of the polyethylene liner are welded together using heat. 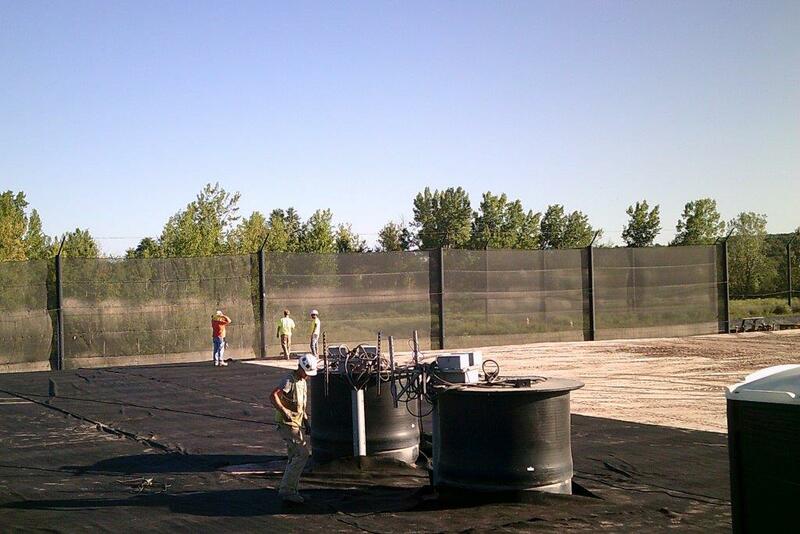 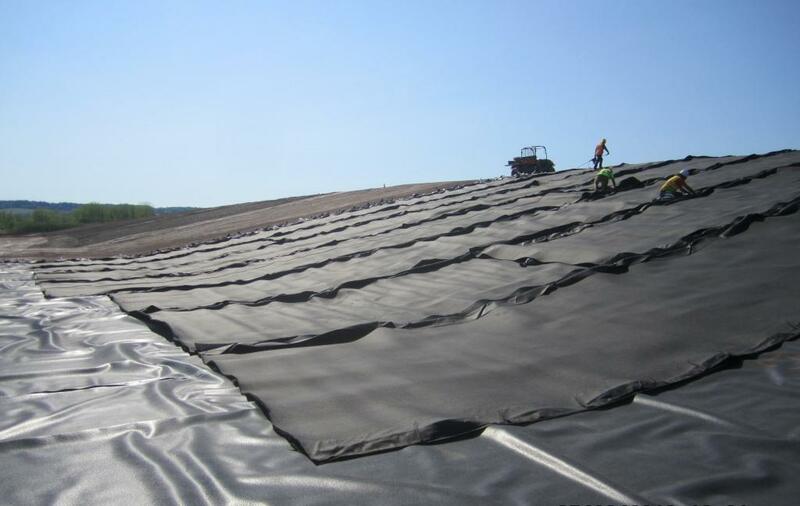 September 2016 - Installation and sealing of the geomembrane, or cover liner, continues. 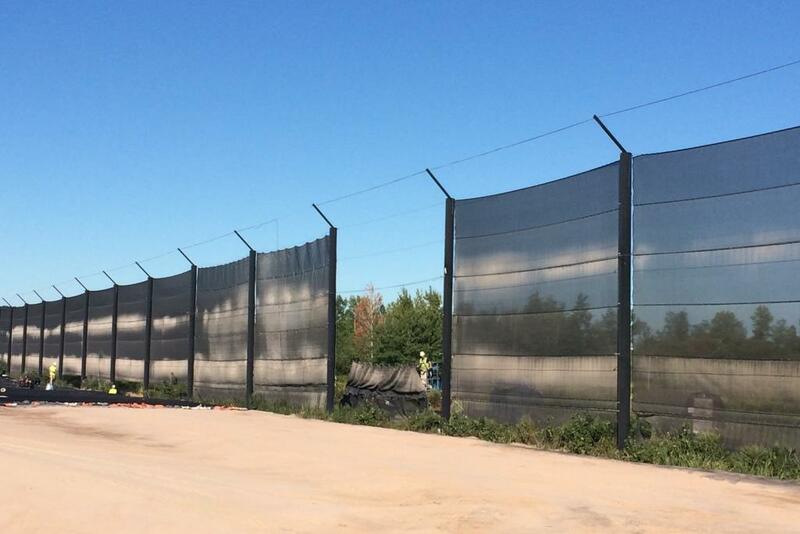 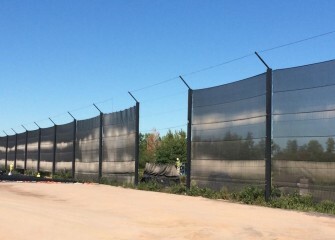 September 2016 - Workers remove sections of windscreen along the north side to make access for the cover construction. September 2016 - After water drains downward by gravity, sump pumps near the perimeter help push it through pipes underground to the water treatment plant. 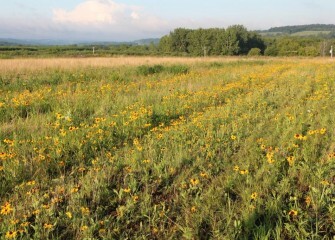 August 2016 - The rye grass will protect topsoil from erosion and weed germination until a more permanent native grassland mix is planted. 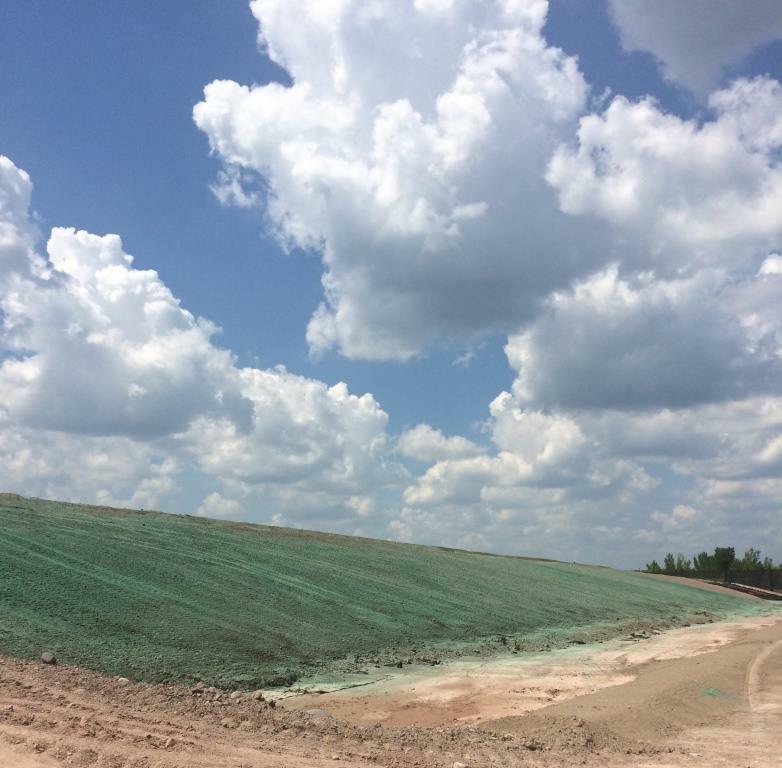 August 2016 - Hydroseeding topsoil with a layer of annual grass begins in August. 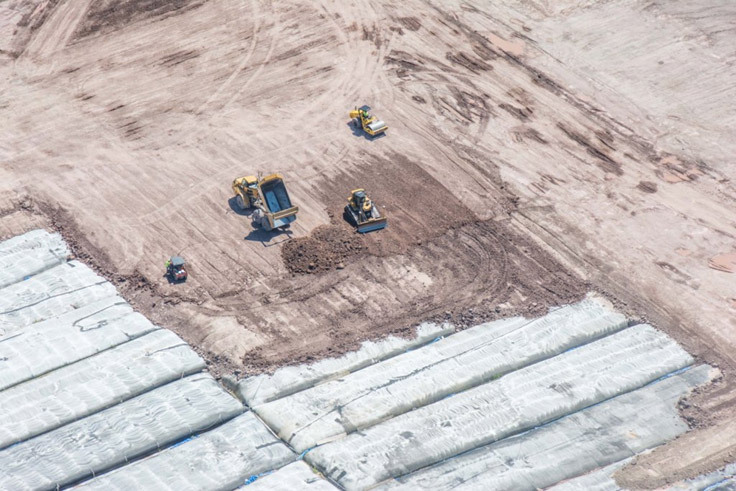 August 2016 - All facets of the cover construction continue, including liner placement, welding liner seams, building soil layers and the storm water drainage system. 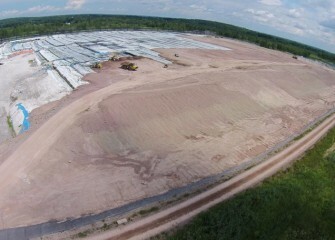 July 2016 - A final layer of topsoil is added to support vegetation. 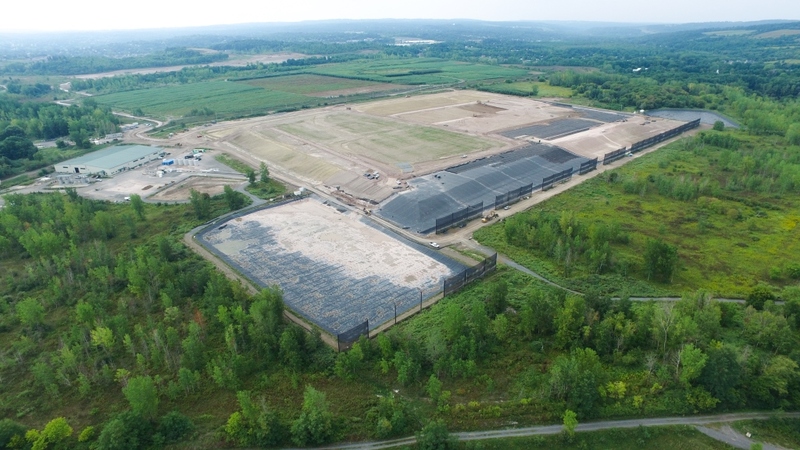 July 2016 - Nearly 30 workers, including engineers, construction managers, craft laborers and a health and safety officer, are working daily at the site. 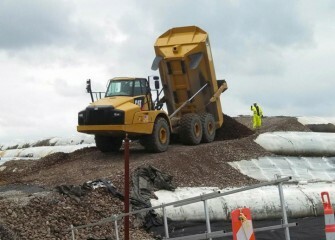 June 2016 - Construction of the soil layer on top of the liner begins. 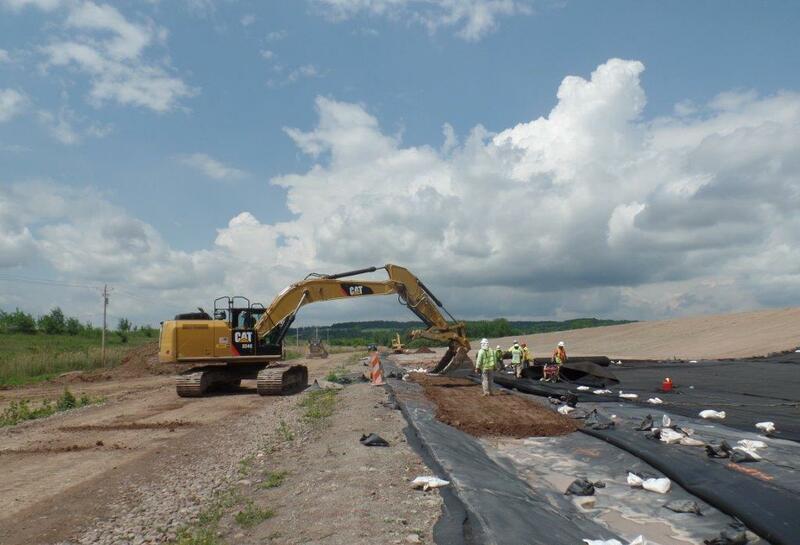 June 2016 - The top liner will be welded to the bottom liner around the perimeter, sealing off the dredged material in geotextile tubes. 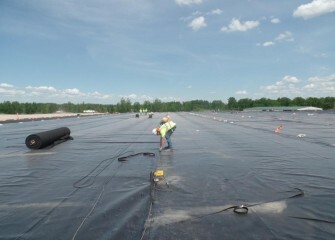 June 2016 - A worker seals cover liner sheets together. 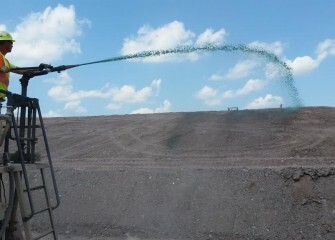 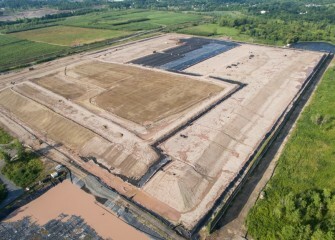 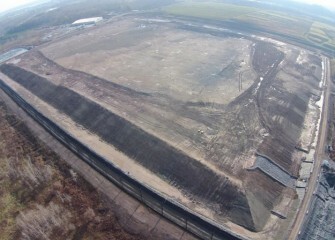 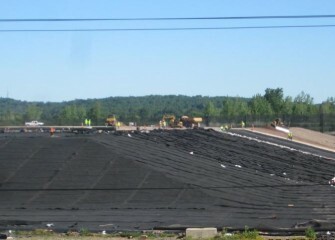 June 2016 - Polyethylene liner is unrolled down a slope of the consolidation area. 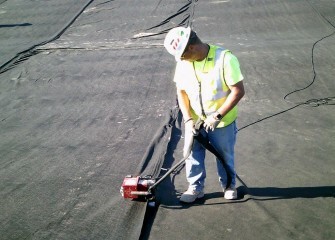 The liner is 40 mil (thousandths of an inch) thick, a little over one millimeter. 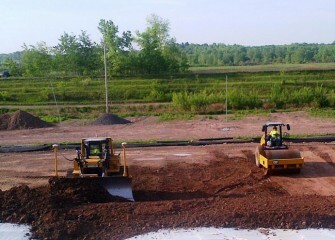 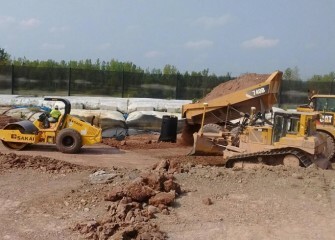 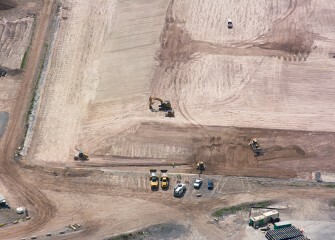 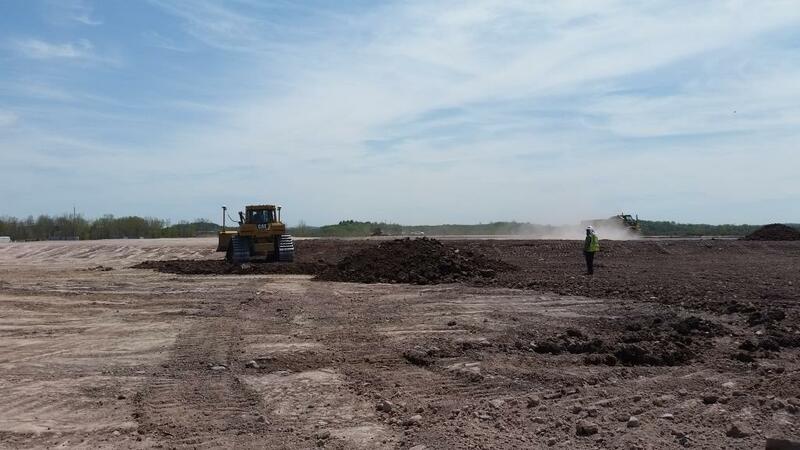 June 2016 - Workers begin to fill channels around the perimeter with soil. 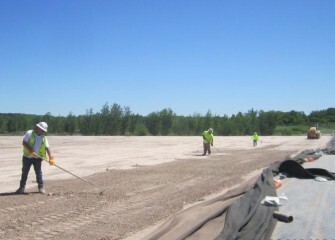 June 2016 - The surface of the leveling layer is raked by hand before cushion and liner placement. 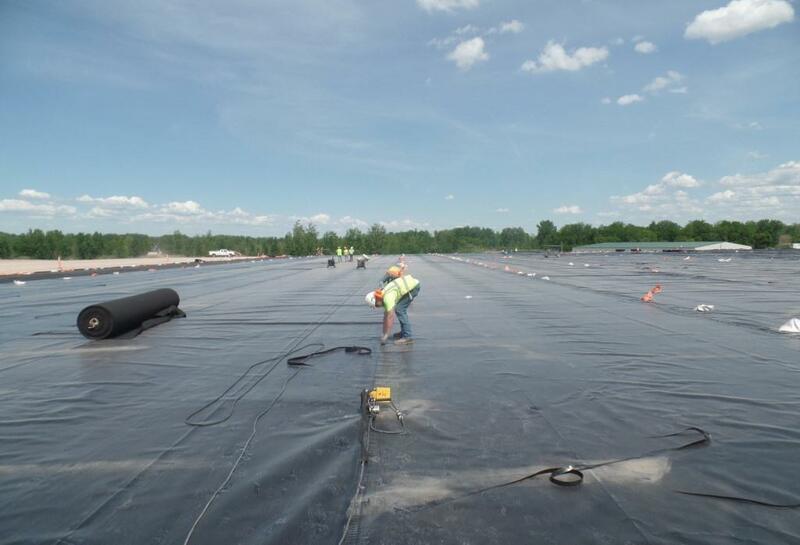 May 2016 - Workers roll out the polyethylene liner. 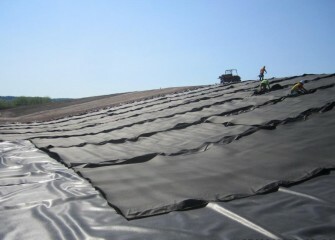 Sheets will be sealed together to create a seamless cover. May 2016 - A layer of geotextile is laid on top of the leveling layer as a cushion and additional protection for the liner. 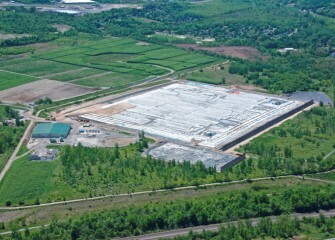 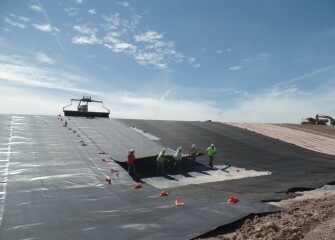 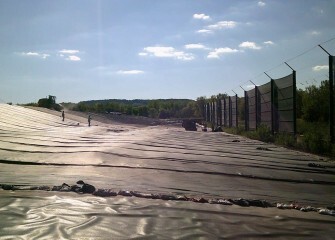 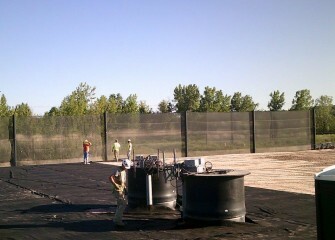 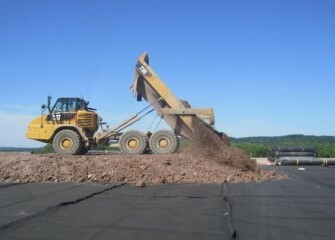 The polyethylene liner is placed on top of the geotextile. May 2016 - Slopes are regraded around the perimeter of the leveling layer. May 2016 - Water draining from geotextile tubes and storm water that contacts the tubes is treated at the consolidation area water treatment plant. 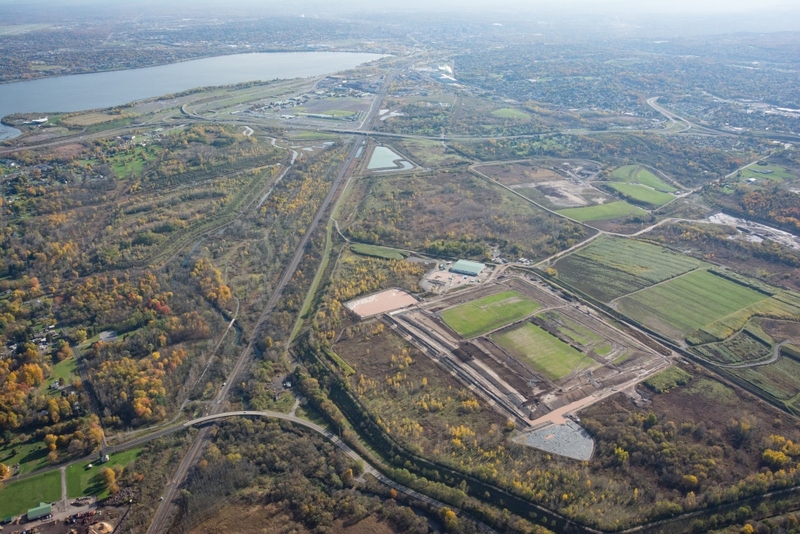 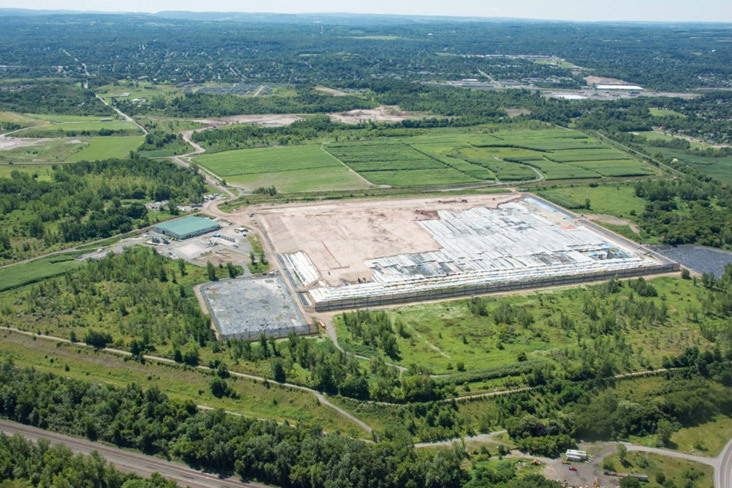 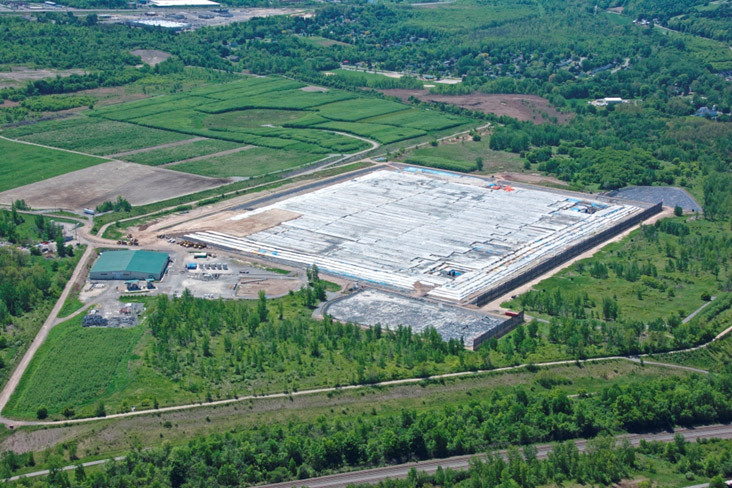 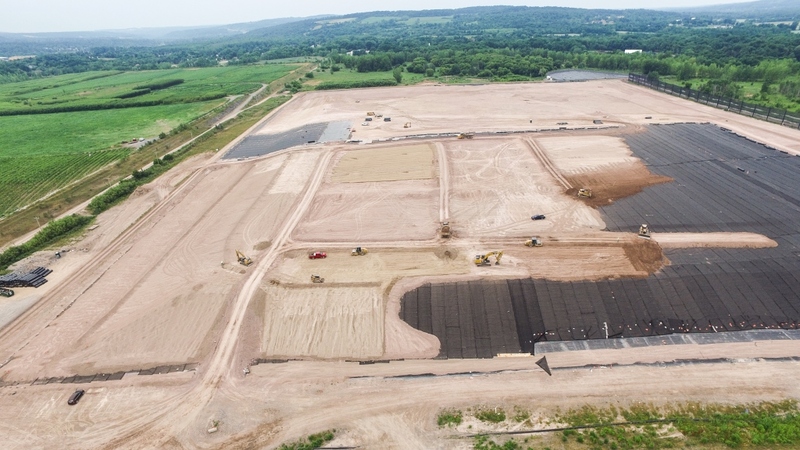 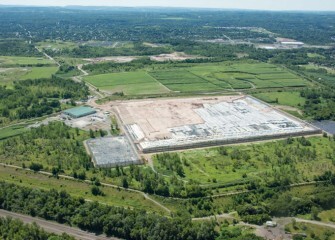 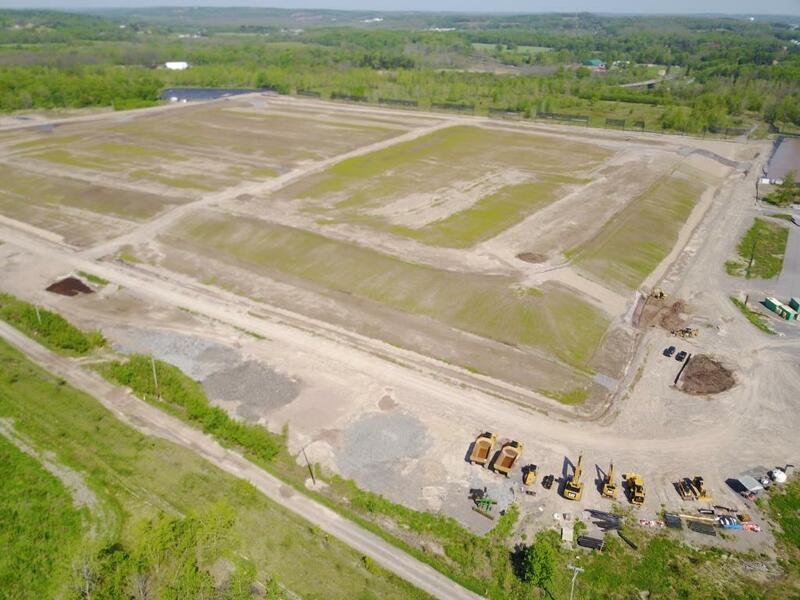 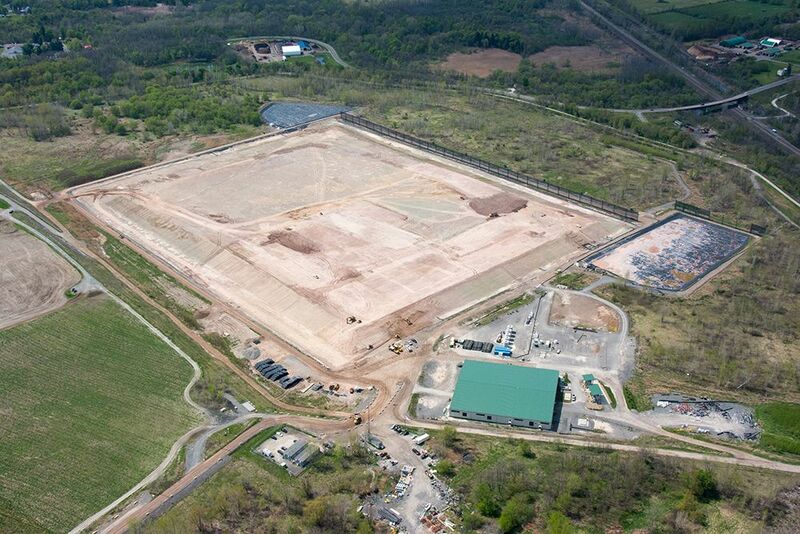 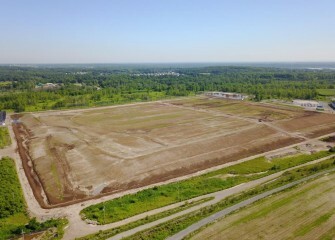 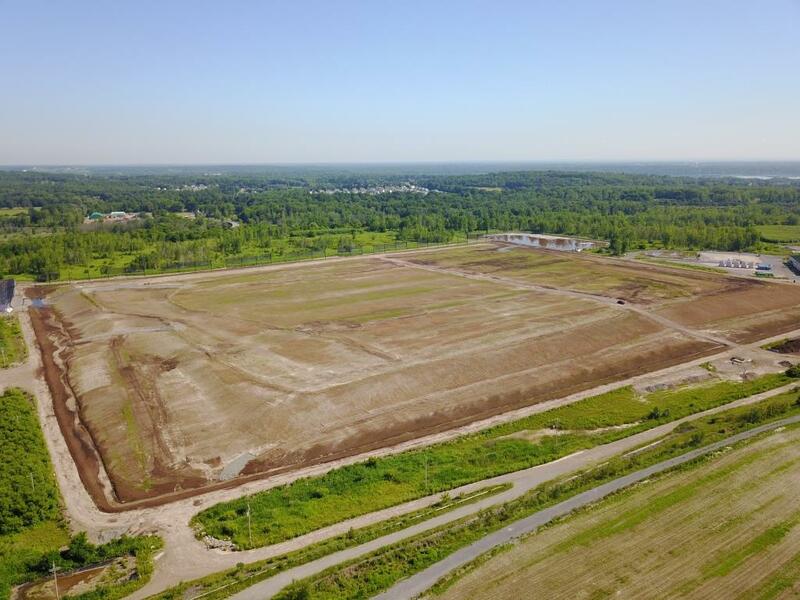 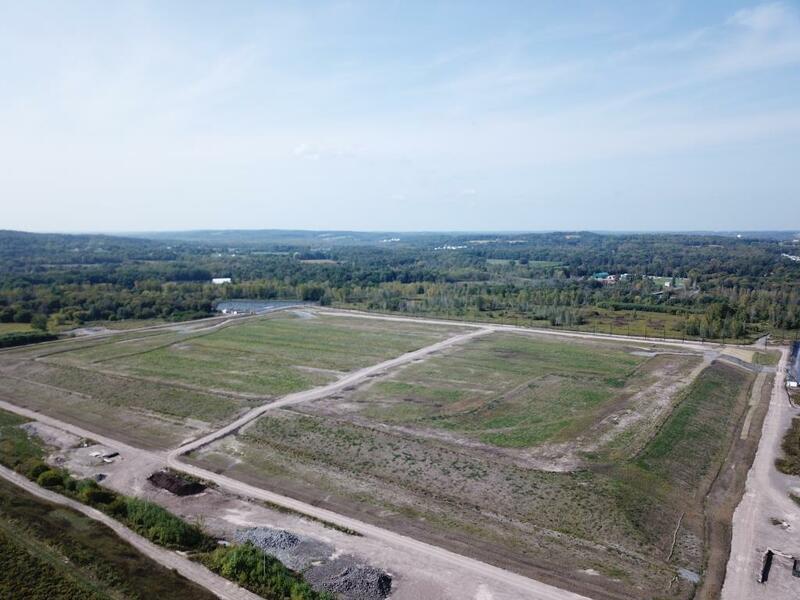 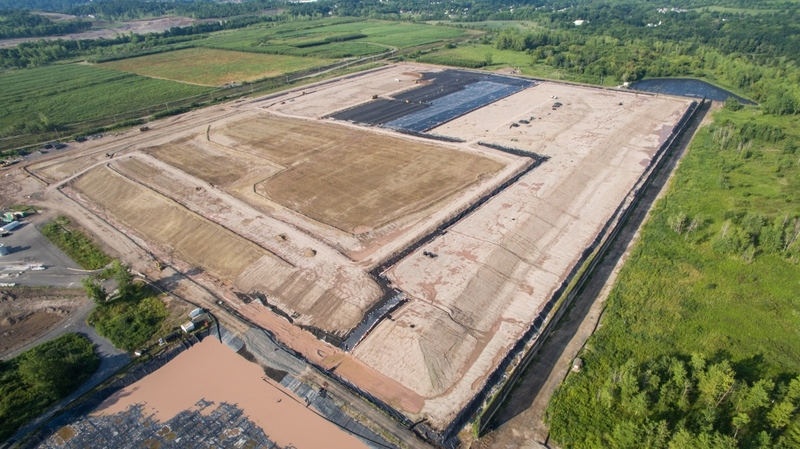 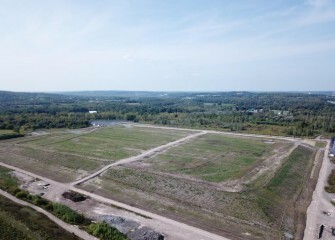 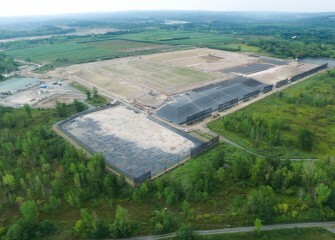 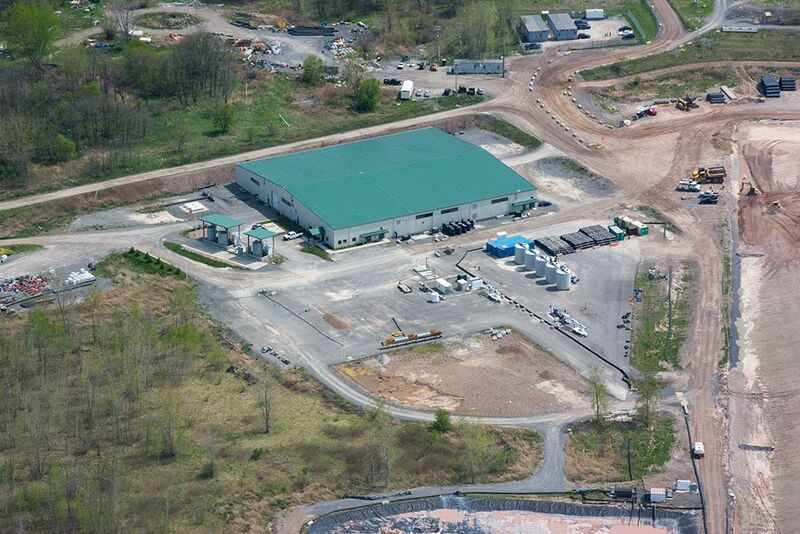 May 2016 - The 50-acre covered consolidation area is built on a 163-acre former industrial site owned by Honeywell. 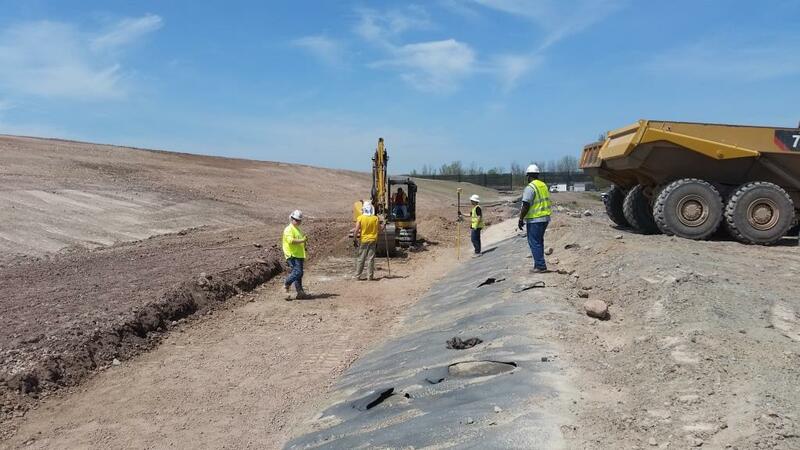 May 2016 - Channels around the perimeter for storm water flow are excavated, then surveyed to ensure proper slope. 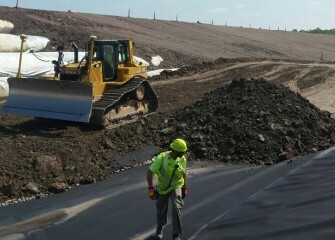 May 2016 - After settling over winter, work to regrade the leveling layer with additional soil begins. 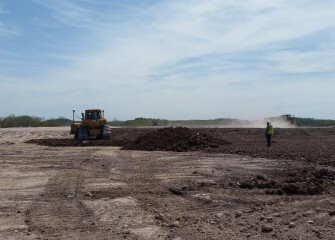 May 2016 - Work resumes covering the consolidation area. 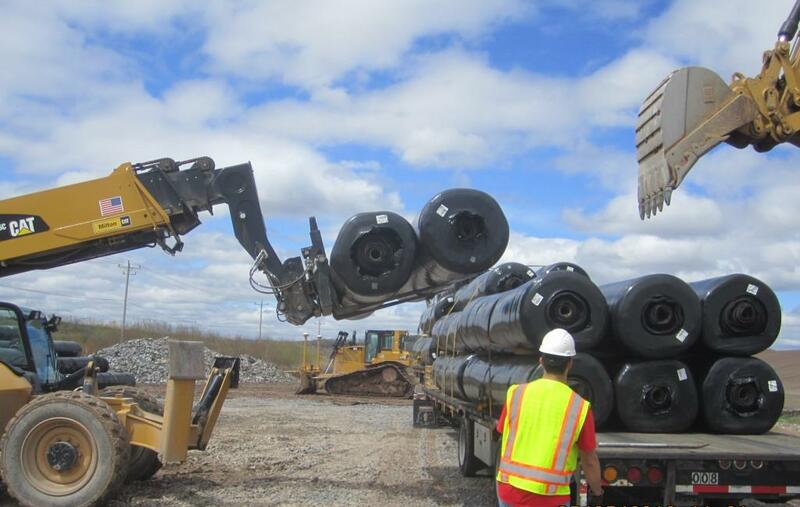 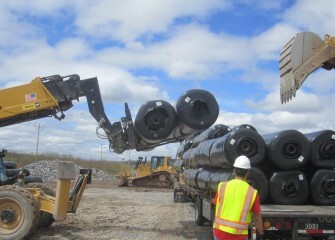 Rolls of geocomposite drainage net are unloaded and stacked at the site. 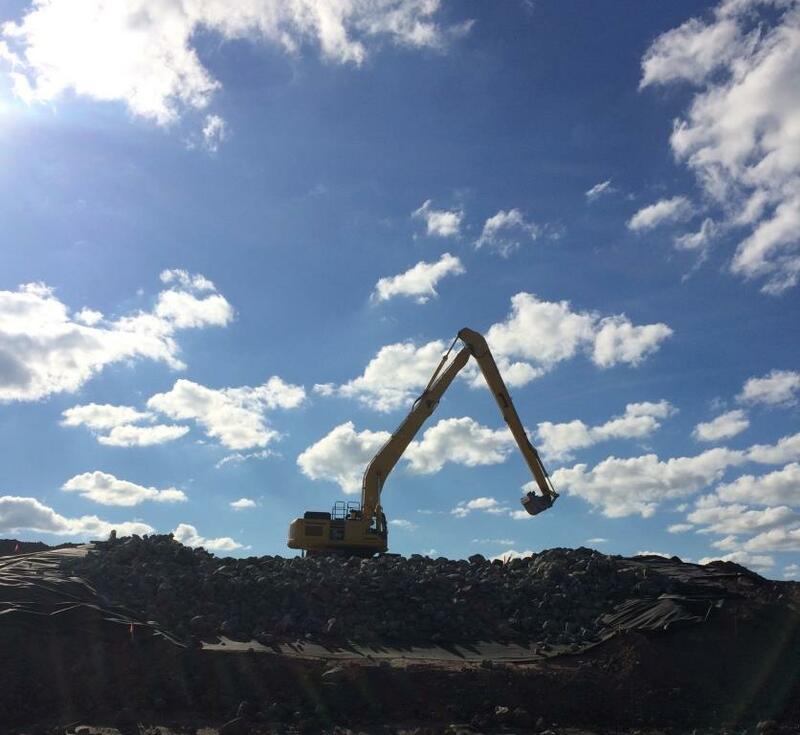 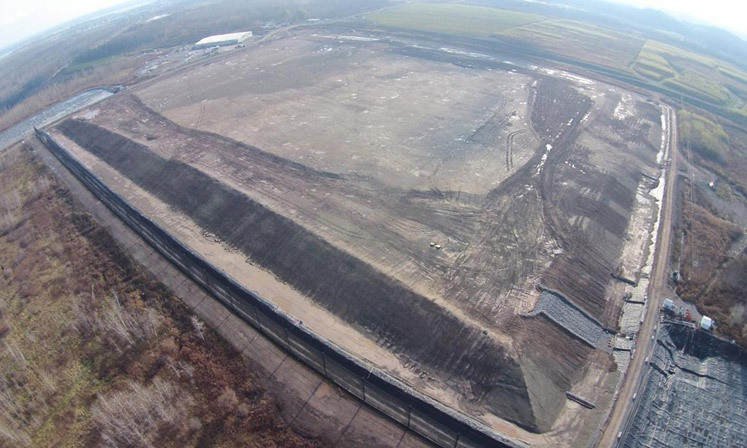 November 2015 - 317,710 cubic yards of soil were used to cover the 979 geotubes at the 50-acre consolidation area. 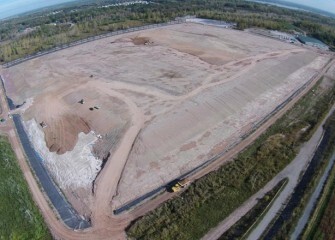 Construction will resume next spring. 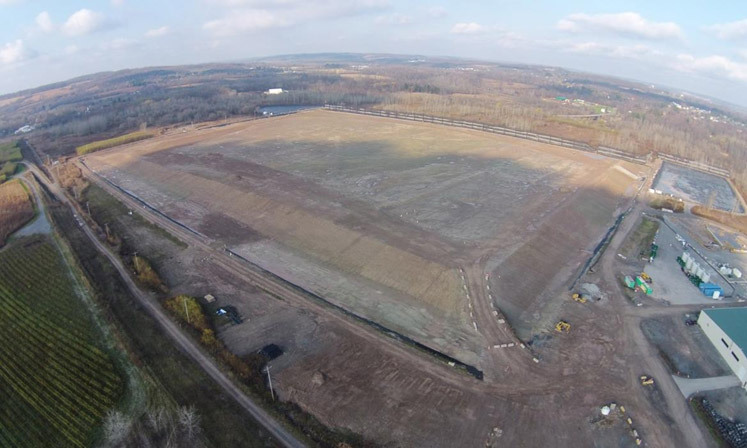 November 2015 - The leveling layer is complete for the 2015 construction season, and will settle over the winter. 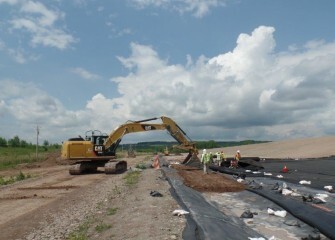 Next year polyethylene liner will be placed on top and welded to the bottom liner, sealing off the lake material. November 2015 - The slopes are tracked with grooves and seeded with an annual winter rye grass. 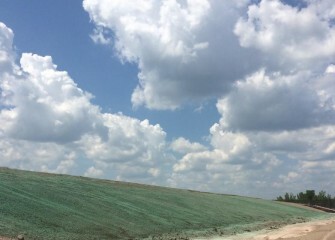 Growing a temporary crop on the slopes helps prevent erosion from wind and rain and suppresses weeds until work resumes next year. 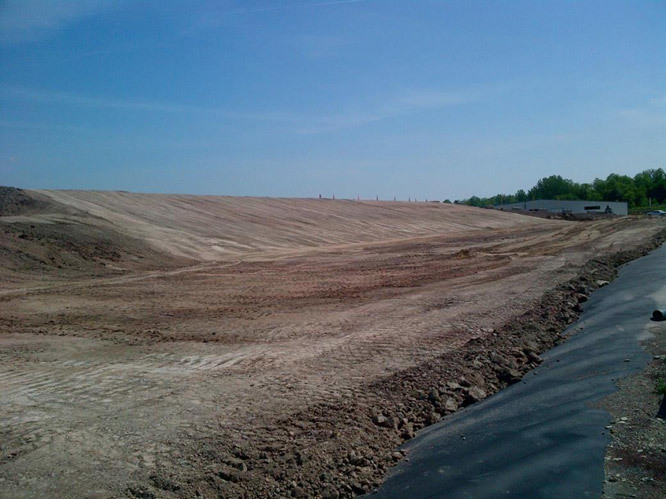 October 2015 - Berms are built on top of the leveling layer to manage rain water flow. October 2015 - Channels filled with rock along the slopes will also help manage rainwater runoff, preventing erosion. 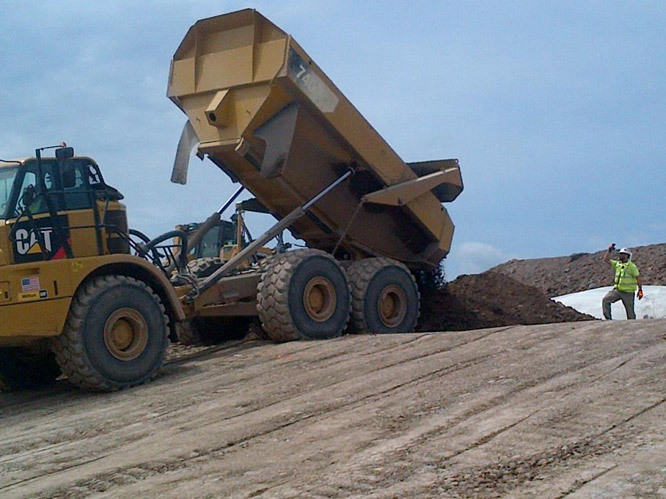 October 2015 - The final truckloads of soil for the leveling layer are delivered to the consolidation area. 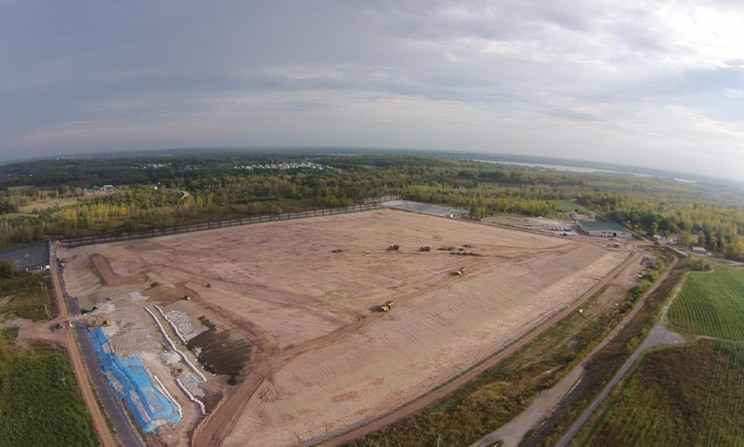 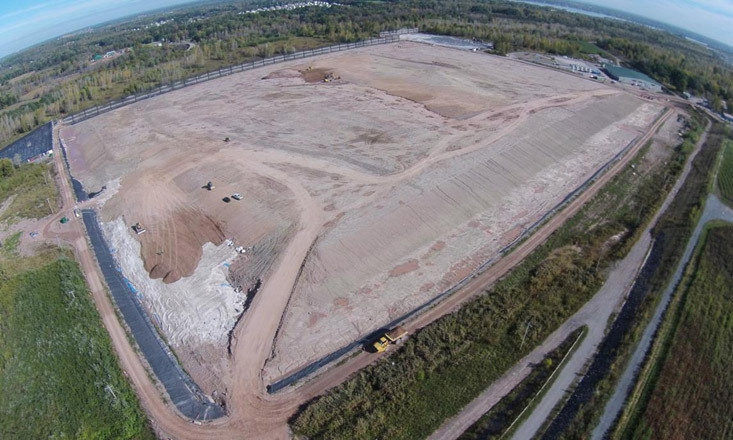 September 2015 - By the end of September the leveling layer at the consolidation area is nearly complete. 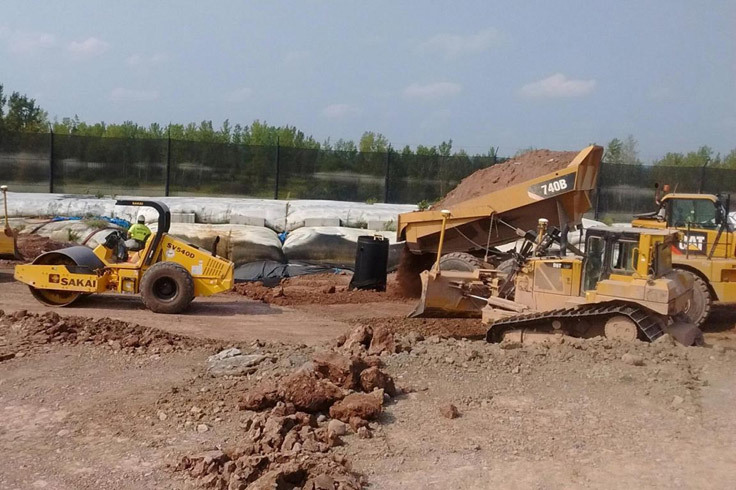 August 2015 - An average of 30 workers including engineers, construction managers and craft laborers are working daily on the project. 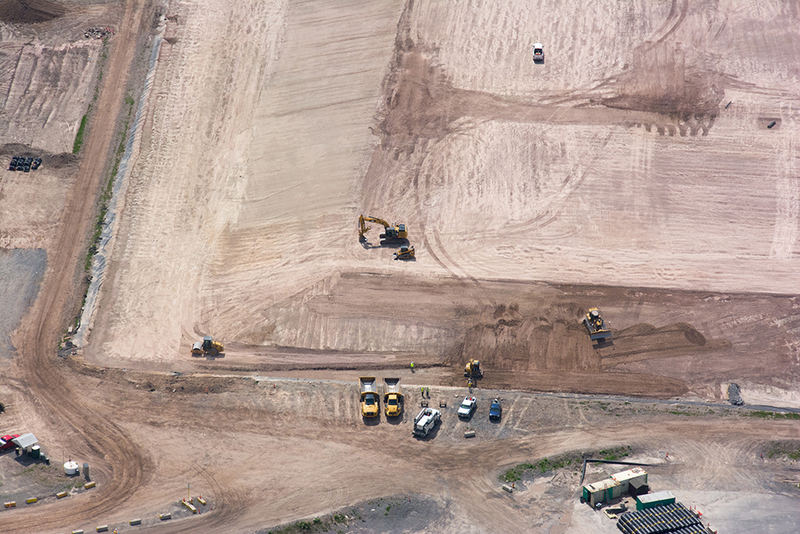 August 2015 - Construction at the consolidation area remains on schedule to complete the leveling layer in 2015. 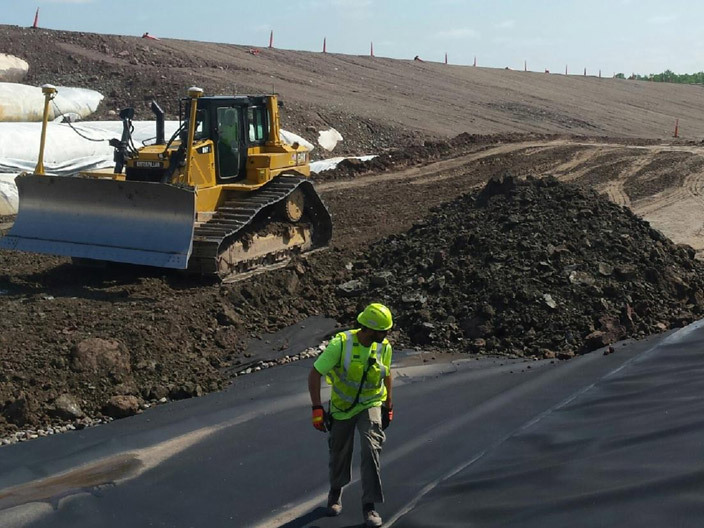 July 2015 - About 3500 cubic yards of soil are added every day to the leveling layer. 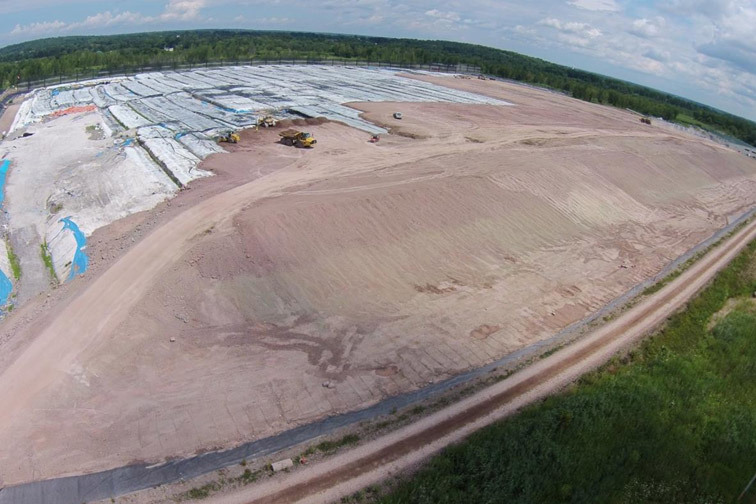 July 2015 - The leveling layer is nearly halfway complete. 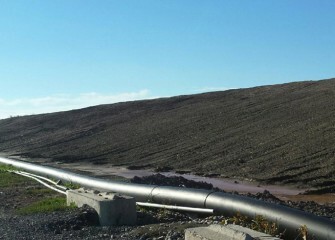 About 2.2 million cubic yards of lake bottom material are contained in the geotubes, covering an area approximately 50 acres in size. 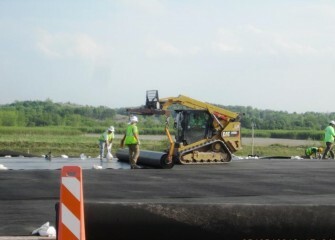 June 2015 - Work continues on additional sections of the leveling layer. 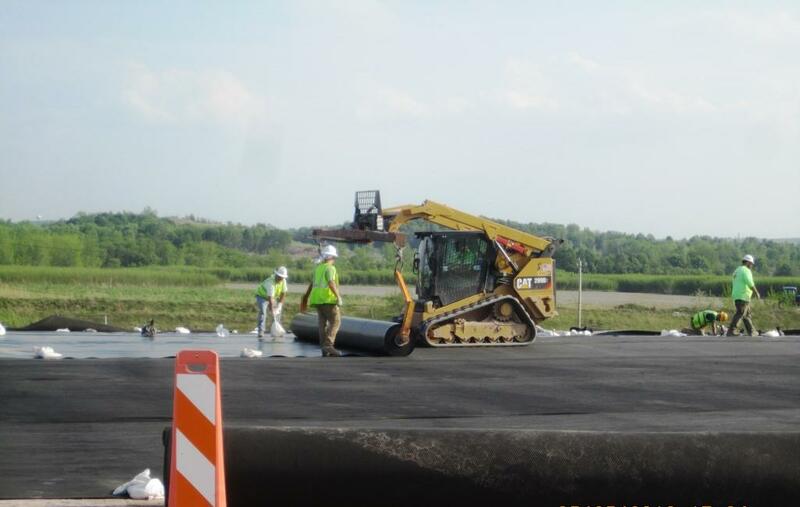 May 2015 - Fill is placed on top of the geotubes to create the leveling layer. 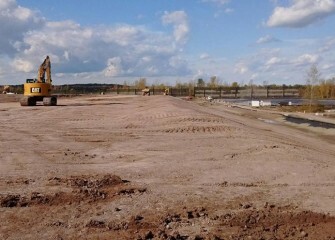 May 2015 - Soil is spread and compacted. 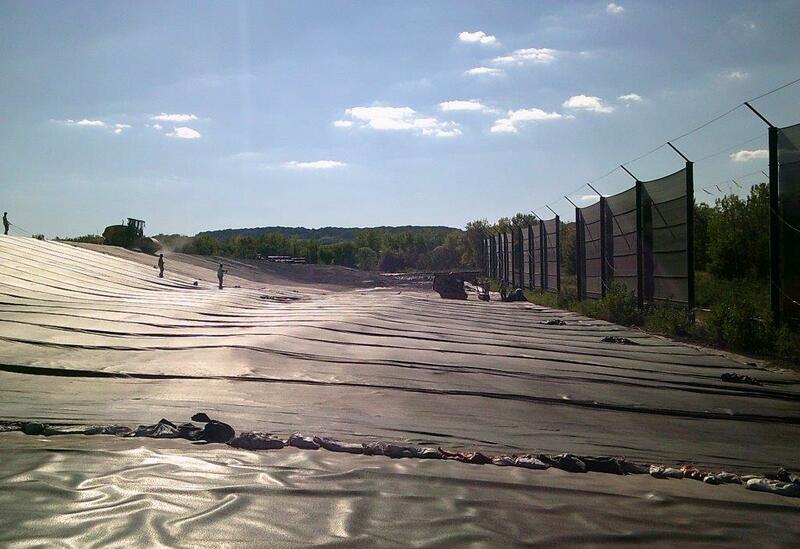 The leveling layer will be completed during the 2015 construction season and allowed to settle over the winter. 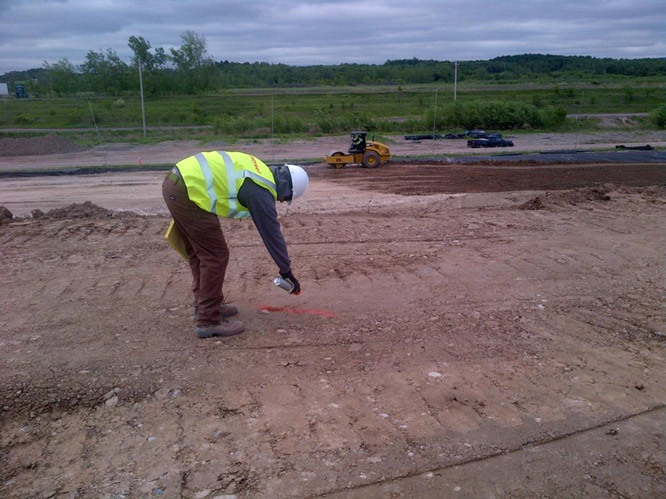 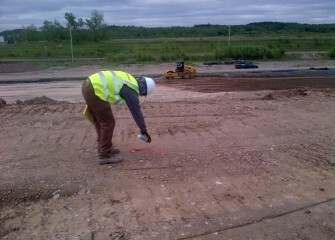 May 2015 - A worker prepares to test compaction of the leveling layer, which averages four feet thick. 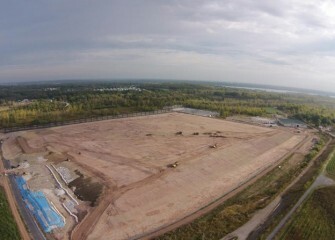 May 2015 - The first section of the leveling layer, in an area sloping from the top down along the south side, is complete. 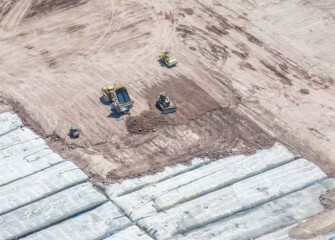 April 2015 - Construction begins to cover, and eventually seal, the sediment consolidation area. 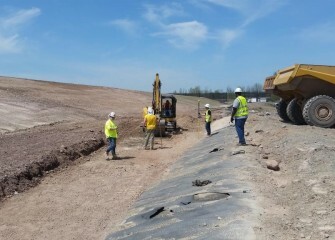 April 2015 - An access road is built up onto the filled geotubes.